Despite healthy market dynamics and strong leasing activity, pricing trends in the U.S. data center market have been somewhat at odds, according to a recent Cushman & Wakefield report. Pricing was largely soft in 2014, but the real estate company expects firmer pricing in 2015. Deal momentum from late 2013 carried over into 2014 and the pipeline points to sustained demand. Despite healthy activity, wholesale pricing in 2014 was flat, at $125-$140 per kW per month. 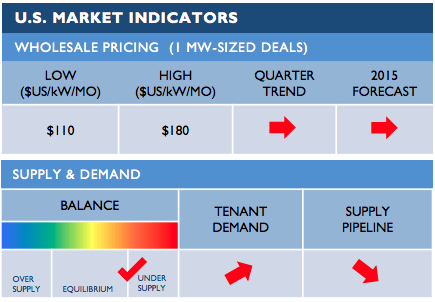 Factors contributing to “soft” pricing in 2014 included a concern about subleased space re-entering the market, leading to a supply-demand imbalance, aggressive pricing for larger deals, and deals seen as having high growth potential. However, large providers are becoming more stringent in concessions, according to West. The firmer pricing is also result of providers being more disciplined in phased construction, leading to a better supply and demand balance. Publicly traded real estate investment trusts are showing more discipline when it comes to pricing, because they could take a bit of perception hit, according to West. A lot of private providers will still aggressively price, but on the whole it will be firmer. West noted that there were fewer purely speculative big builds in 2014 with more providers taking a phased approach. The ability to perform “just in time” builds doesn’t skew the supply-demand dynamic toward the buyer as it has done in the past. Alternatively, by not building too far out ahead, in many markets it takes only a few deals to create a vacuum of no immediately available capacity, said West. Some markets might see temporary pockets of supply constraints similar to the situation in Northern Virginia this time last year because of fewer speculative builds. West pointed out that Dallas, a market considered largely oversupplied a year ago, now has a dwindling number of large wholesale options. Digital Realty, the largest landlord in the market, has no new capacity available until later in the year. CyrusOne and QTS are the only providers with large blocks that are immediately sellable. In addition to Dallas, the Northern Virginia data center market was the most vibrant of 2014. Each had nearly 40 megawatts worth of new data center leases. Other markets highlighted were Minnesota, which has emerged as a market capable of attracting sizable deployments following several investments, and Santa Clara, California, which only has a handful of large first-gen wholesale space options available. The report also noted that there was a lot sublease space at the beginning of the year along with concern that this would negatively impact market dynamics. The space has seen healthy interest from Facebook, Yahoo, and Zynga in Northern Virginia and Northern California. Vantage Data Centers, a major Santa Clara player, recently discussed the sublease dynamic in California with DCK. The Cushman report also mentions some of the larger lease deals, acquisitions, and other activity. Large wholesale deals included LinkedIn (7 MW) T-Mobile (4.5 MW) and State Farm (over 6 MW). A big acquisition was Zayo gobbling up Latisys and its 180,000 operational square feet for $675 million. Notable builds include T5 breaking ground in Portland with multi-megawatt anchor tenant and Switch’s $1 billion entry into Reno, Nevada, with eBay as anchor tenant. A recent report published by commercial real estate firm North American Data Centers examined wholesale leasing, determining it was up 37 percent in 2014.